Network patch panel set-up is yet another form of cabling Toronto and requires well structured cable plan as well. There are various patch panels we install in terms of configuration and sizes including Custom Patch Panels. All these panels are designed to manage cable connections. For more clarity, there are jacks on the front side of the panel designed to receive short patch cables, while the jacks or punch down blocks on the back side receive connections of long and permanent cables. There is also an arranged hardware assembly – in such a way that several circuits appear on the jacks – for testing, monitoring and interconnecting conveniently and flexibly. This allows technicians to efficiently change the circuits of select signals with the exception of expensive switching equipment use. Therefore, you get to switch the sockets at no out of pocket expense. 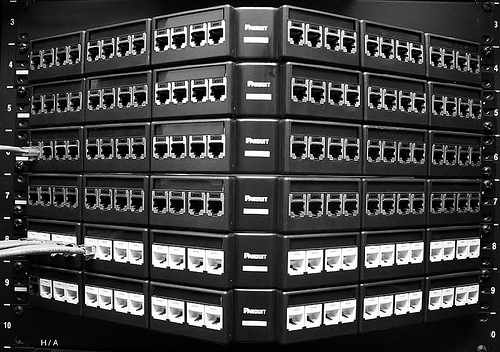 The patch panels are mounted on a rack, although some are designed to be mounted onto a wall directly.